2017 was the pilot year for From the Top’s Alumni Leadership Grant, which funds leadership initiatives launched by our alumni all across the country. 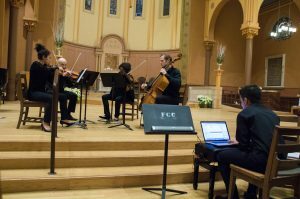 One of those grants supported FTT alum Avik Sarkar as he spearheaded a benefit concert in support of the Boston Center for Refugee Health and Human Rights. 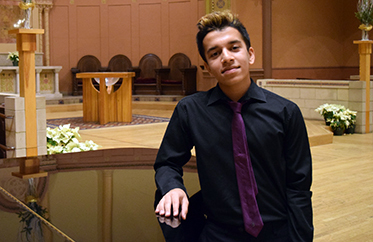 Not only did Avik fundraise, program, and manage the nuances of planning the January 2018 concert, he also composed one of the pieces featured on it. Writing [From Voices] meant that I first had to locate members of the refugee community in the Boston area who were willing to speak to me about their experiences, a task that quickly proved difficult. Sayid, an Egyptian man who moved to the United States in 2012 because of tensions in his home country, was my first interviewee. His is one of the first voices heard in my piece. The process of interviewing Sayid was not exactly what I had expected it to be. After meeting in a lackluster Starbucks, we exchanged awkward hellos, and I explained the details of the project to him. He seemed nervous, hesitant; I was worried that I would not get the information that I needed, that the interview would be a failure. Once he started talking, though, I realized that I was wrong. Sayid told me of the life that he once enjoyed in Egypt, a life that he shared with his loved ones and friends, a life transformed by growing political and social conflict. After a while, I stopped taking notes so that I could just hear his remarkable narrative. But in his humble, unassuming way, Sayid continuously stressed that his story was not unique – thousands have faced and are facing the struggles that he endured. A conversation that I had planned to last fifteen minutes took up an hour as I listened to all that Sayid had to say. This experience made me remember why I had taken on this project in this first place – to give marginalized people a space, even in a very small way, to tell their stories and share their backgrounds. You can listen to Avik’s piece, From Voices, and learn more about Avik and his musicianship at www.aviksarkar.net. To watch the full video of his benefit concert, click here!